Joe West & Bob Davidson had 2016's Best Ejections [2015: Bill Welke & Jim Reynolds]. Voting Results (Top 4): West-159 (23%); Davidson-FAN (16%); Everitt-142|5 (13%); Gorman-006 (9%). Click here for West/Maddon & video. 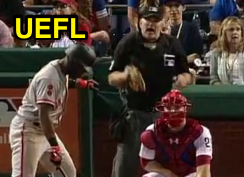 Joe West and Bob Davidson were the two umpires with the UEFL's Ejections of the Year for 2016. 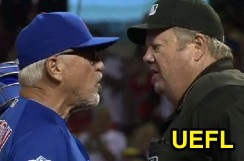 In Ejection 159 - Joe West (5; Joe Maddon), HP Umpire Joe West ejected Cubs Manager Joe Maddon after enforcing certain pace-of-play procedures pursuant to Official Baseball Rule 5.10(l), which states, "Any attempt to evade or circumvent [the maximum of one mound visit per batter] rule by the manager or coach going to the catcher or an infielder and then that player going to the mound to confer with the pitcher shall constitute a trip to the mound." In the 9th inning, Cubs pitcher Kyle Hendricks surrendered a home run—breaking up a no-hitter and shutout—after which Cubs catcher Miguel Montero visited Hendricks on the mound and returned to home plate. Upon his return to home plate, several Cubs infielders subsequently visited Hendricks on the mound as substitute pitcher Aroldis Chapman began to warm in the bullpen; West attempted to break up the delay and/or charge a mound visit if the meeting was not broken up, pursuant to Rule 5.10(l), leading to Maddon's argument and ejection. Chapman subsequently entered the ballgame. Click here for Davidson/Fan & video. In an Unofficial Ejection of a Fan on August 2, Bob Davidson requested the removal of a spectator in Philadelphia after witnessing a purported vulgarity or obscenity, marking the first publicized umpire's request to remove a fan during play since Tim Welke's ejection of a Bryce Harper heckler in 2014. Davidson's request to remove the fan is permissible pursuant to OBR 8.01(b), which states, "Each umpire is the representative of the league and of professional baseball, and is authorized and required to enforce all of these rules. Each umpire has authority to order a player, coach, manager or club officer or employee to do or refrain from doing anything which affects the administering of these rules, and to enforce the prescribed penalties." Accordingly, Davidson was indeed authorized to order Phillies security—a club officer or employee—to remove the fan, whose conduct Davidson had deemed was in contravention of the conduct of a game, in accordance with baseball's rules. After the game, Davidson summed up the crowd's reaction thusly, "I turned around and said, 'You know what, get rid of this guy. '...People cheered me, which is unusual in this town for me." Davidson retired last month after a 28-year Major League career. Joe West now has 24 points in the Umpire Ejection Fantasy League (23 Previous + 1 Award = 24). Bob Davidson now has -4 points in the Umpire Ejection Fantasy League (-5 Prev + 1 Award = -4). The final postseason award, (Best) Umpire of the Year, will be released tomorrow.